SANRAKSHAN (2017 / 2074) is the Nepali movie made under the banner of Purnendu Productions. The movie stars Nikhil Uprety, Saugat Malla, Ramesh Ranjan, Malina Joshi, Ashishma Nakarmi, Pramod Agrahari, Kamesh Kumar, Krishna Singh, Ramesh Budhathoki, Nir Shah, Shweta Shah, Nandu Shriwastav, Nirdesh Sriwastav, Raj Katuwal. SANRAKSHAN is an action thriller movie. Nikhil Upreti and Saugat Malla are sharing the screen first time in this movie. They both are playing as the police officer in the movie. The movie is based on the story of Madhesi Politics. 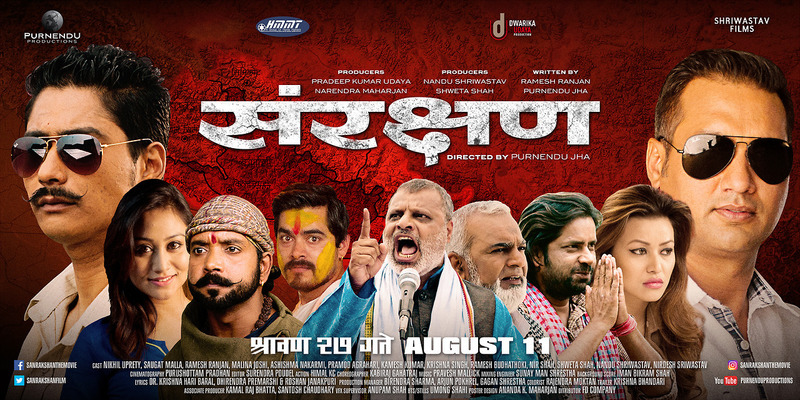 Purnendu Productions Presents Nepali movie SANRAKSHAN starring Nikhil Upreti & Saugat Mallat in the lead role. The movie is scheduled to release on Shrawan 27, 2074.